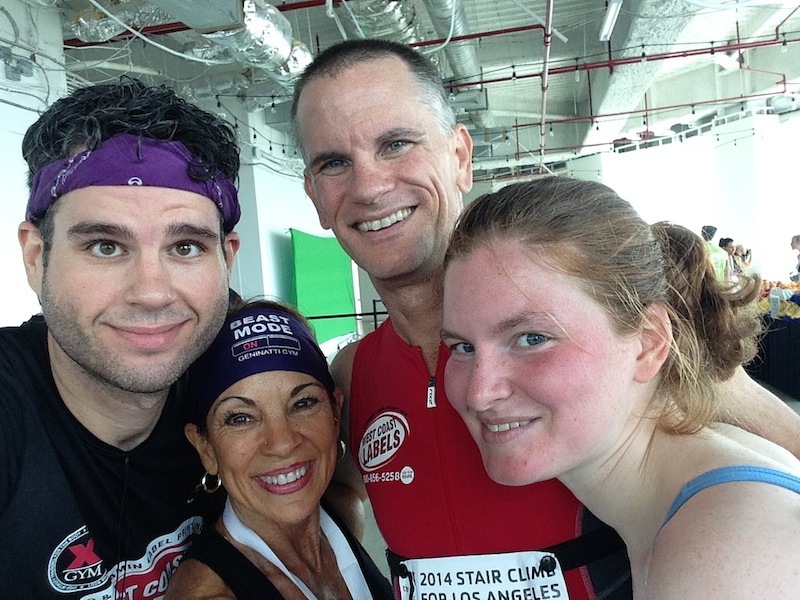 Race Recap: Stair Climb For Los Angeles 2014 | Keep It Up, David! At one point during the day on Friday, I collapsed onto the floor, and, for a few minutes, I couldn’t have gotten up to save my life. Every muscle burned. My heart was pounding close to 170 beats per minute. I could have filled a bucket with the sweat dripping down my face and soaking my clothes. 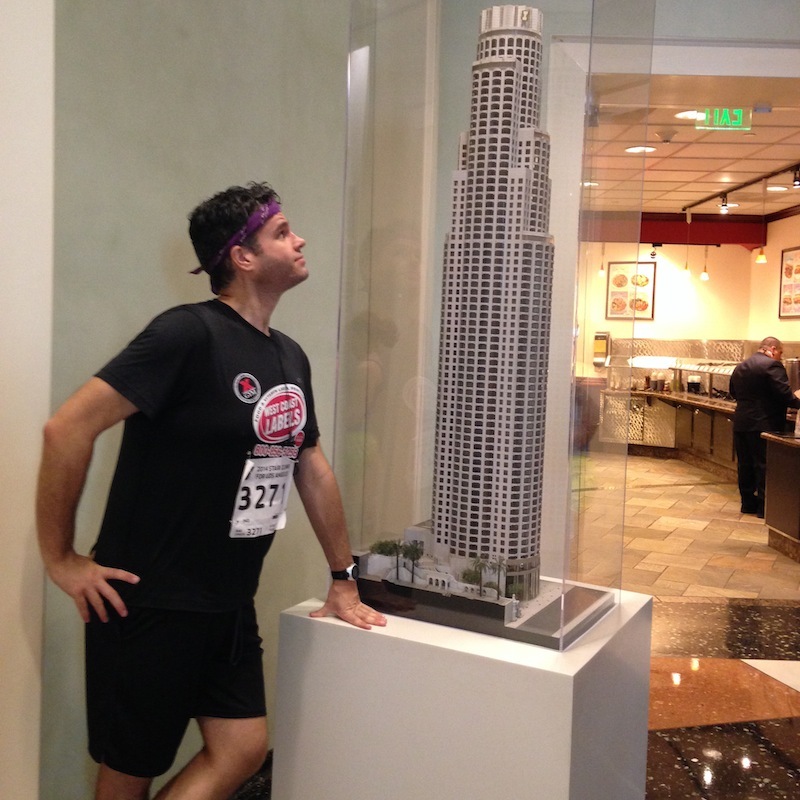 This is what happens to me at the end of a stair race, and on Friday, I raced up the tallest building on the west coast. 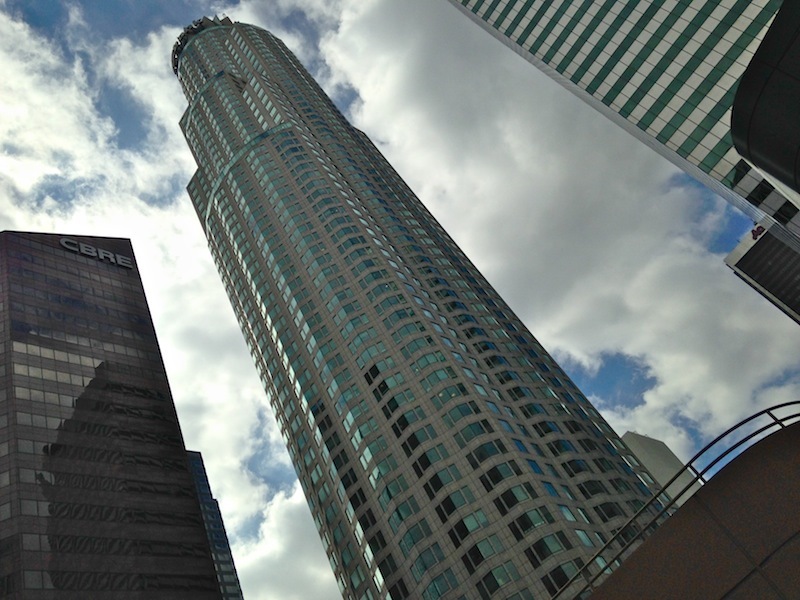 The building is called the US Bank Tower, and every year, the Downtown-Ketchum YMCA hosts a fundraiser race called the Stair Climb For Los Angeles, where you climb the stairs as fast as you can, from sidewalk to roof. The climb is 75 stories. There are 1,664 steps. The finish line is 1,005 feet above the starting line. This race is no joke. This is my second year competing. 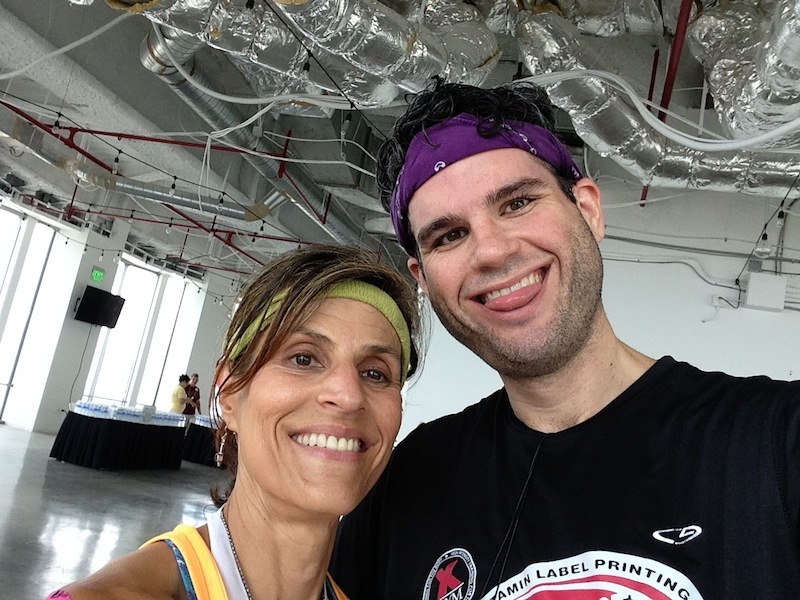 Last year, I made it to the roof in 20 minutes, 29 seconds (read my 2013 Race Recap here). This year, my goal was simple: to beat that time. I’d been training hard. 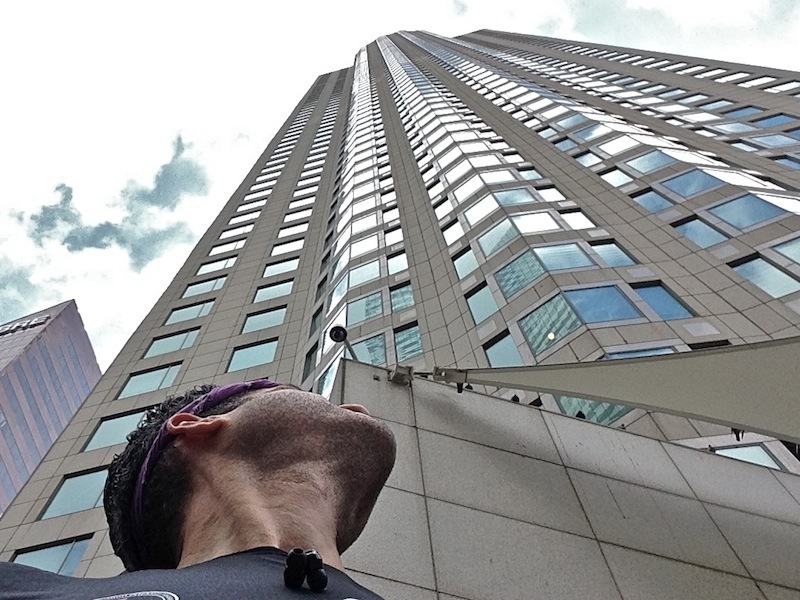 I climbed a 55-story building 13 times in the six weeks leading up to the race, and, before that, a 20-story building 12 times. 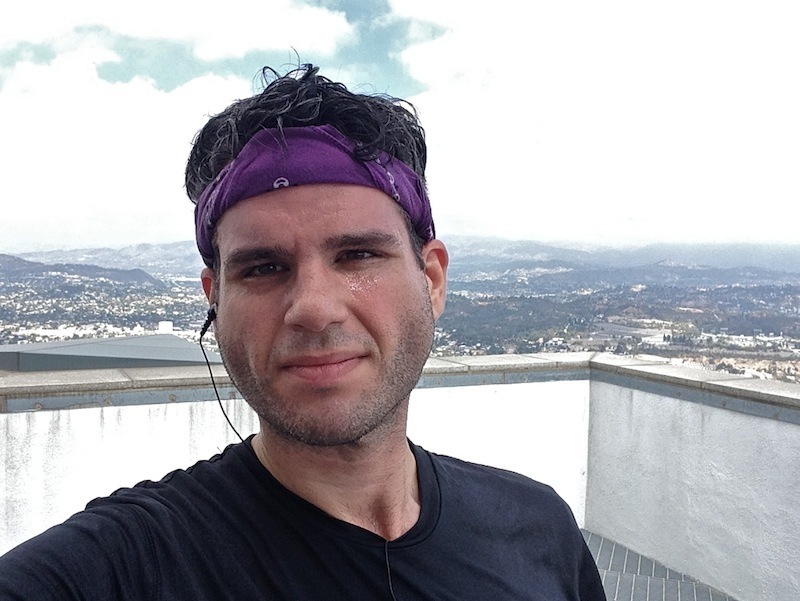 I also trained at an outdoor stairway that an Olympian has trained on, and when a heat wave prevented me from training outside, I blasted my legs with 105 box jumps at my gym. Climbing the US Bank Tower is not an easy undertaking, but I was ready, and when I arrived on Friday morning, I couldn’t wait to get inside. This race is the biggest in the region, attracting over 4,000 participants, including a few hundred firefighters and first responders, who compete wearing full gear. It’s a well-organized and well-run event, with people entering the stairwell every 5 or 10 seconds from 11:30am until nearly sunset. My race started off strong. I double-stepped, I made efficient turns on the landings, and I moved along at an aggressive clip that I could maintain. The first half was a blur – and then I reached the 40th floor. That’s when my side started to cramp up. I slowed a little bit, but pushed through it, and by the time the 50th floor hit, it had mostly subsided. Even though the cramp was gone, exhaustion had set in. Double-stepping had become too difficult, although I tried to keep doing it every fourth flight or so. I started taking additional steps on the landings, but I never stopped. I smiled at the volunteers manning the water stations every 10 floors or so, but I didn’t want to lose seconds pausing for a drink, so I kept going. The final five floors were brutal, but I tried to kick it back into high gear to finish strong. 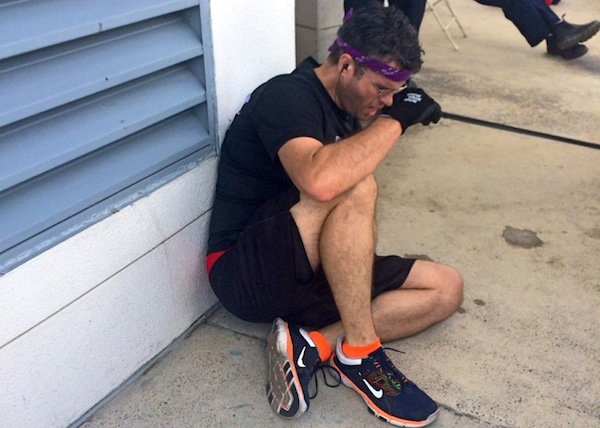 When I collapsed just feet after crossing the finish line, I knew I had succeeded in doing that. After a few minutes on the ground, I was able to get up and enjoy the moment a little more. 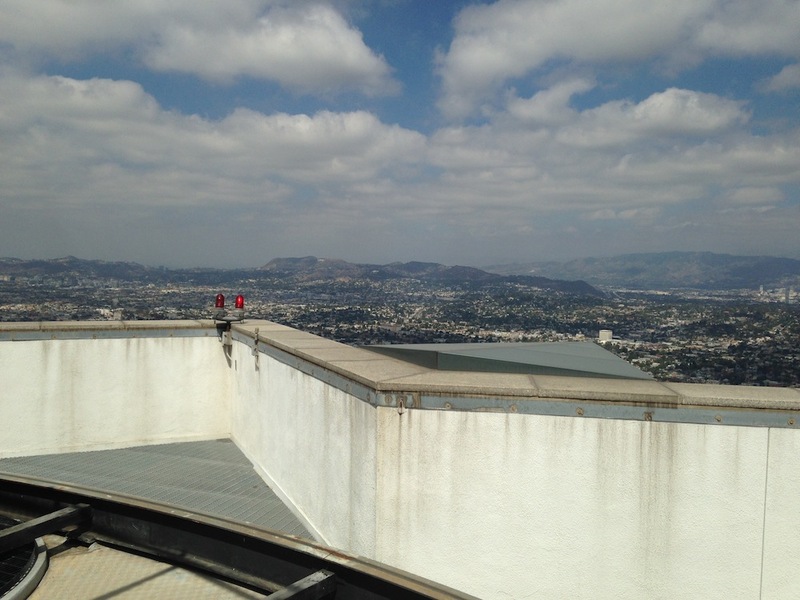 Being on the highest roof in town is an incredible feeling, and the view is spectacular. 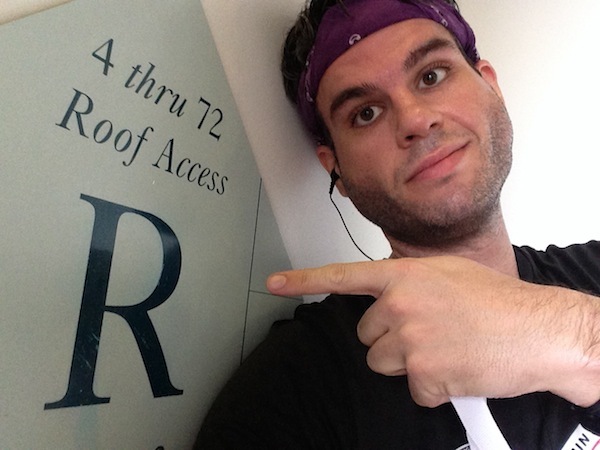 Most of the roof was roped off, but there was tons of space to congregate on the 71st floor, where there was water and fruit to help rehydrate and refuel. I hung out up there for the better part of an hour, chatting with fellow friends and racers, comparing notes, and enjoying the view. We eventually headed down to the street, and soon after that, they started posting results. Remember my goal of setting a new personal best? Mission Accomplished. 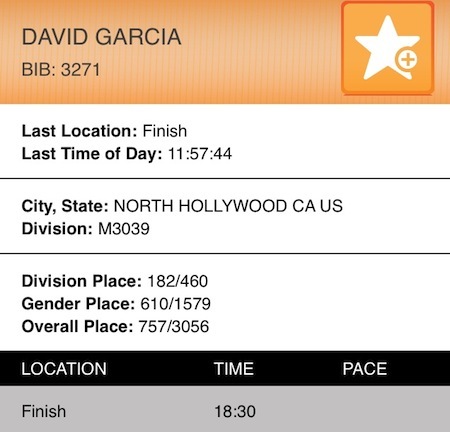 Almost exactly TWO MINUTES FASTER than last year! I shaved almost 10% off my time! I was in the top 25% of all finishers! This was exhilarating news. And how did I celebrate? By climbing the US Bank Tower two more times. Neither of these climbs were official – I removed the timing chip off my bib, and just did it for the fun of it. PJ and Beverly zoomed ahead quickly, but I kept a casual but consistent clip, paused at the water stations, and made it to the roof in about 22 minutes. Also in that picture is Karen and Maggie, who came from Illinois and San Francisco, respectively. 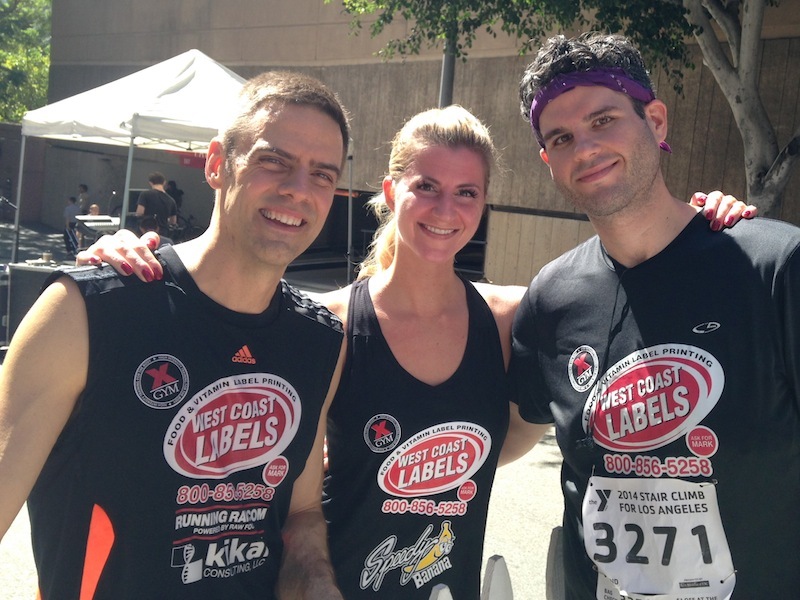 There were West Coast Labels teammates that came from, among other places, Seattle, Colorado, Texas, and Indiana. I met a new friend, Martin, who came from Denmark. (!) It was fantastic to see everyone, and the day just confirmed how I already felt about these folks – which I shared a few months ago, in this post. One of my favorite pictures from the day was taken by a complete stranger, who took this photo in the lobby after my first climb. I love a good architectural model, and it was impressive to see, at a more manageable size, a representation of the building I had just climbed. By the end of the day, I had climbed 225 stories in this skyscraper. 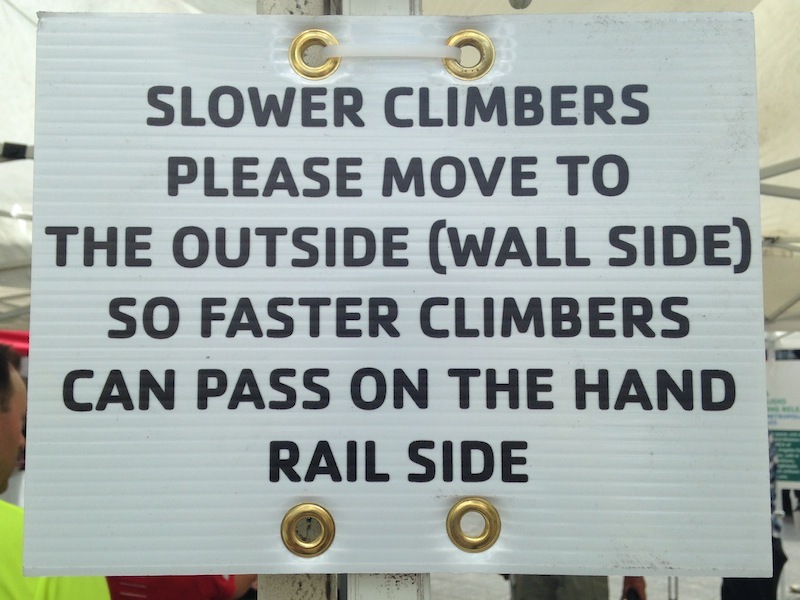 That’s 3,015 vertical feet – the equivalent to a stairwell reaching almost 3/5th of a mile into the sky. 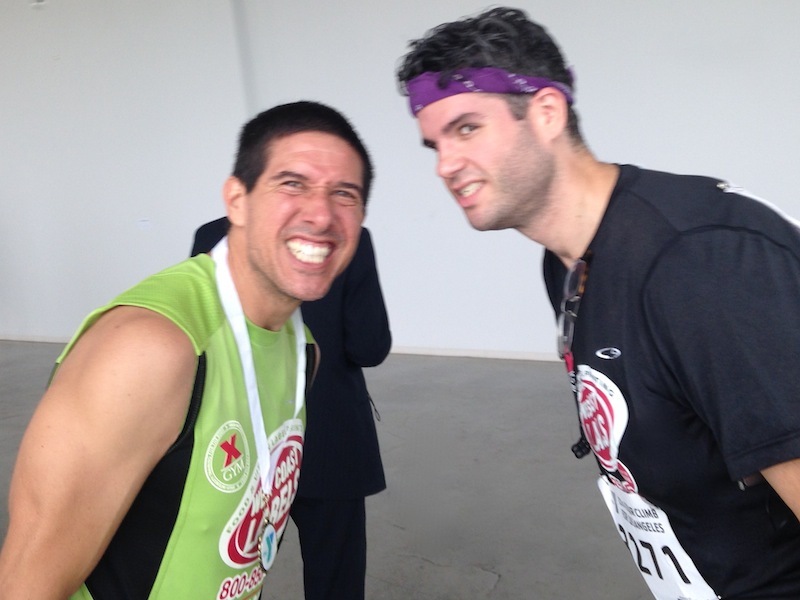 And, in the process, I crushed my goal and finished the race in 18:30. I felt my accomplishments in every single muscle. It hurt. But that feeling of being on the roof, with 1,664 steps below me, is so much more powerful, and will be so much more memorable. PS: A BIG HUG and SHOUT-OUT to Suzanne, Felise, and Joanne & Joe – the donors who very kindly contributed to my fundraising. 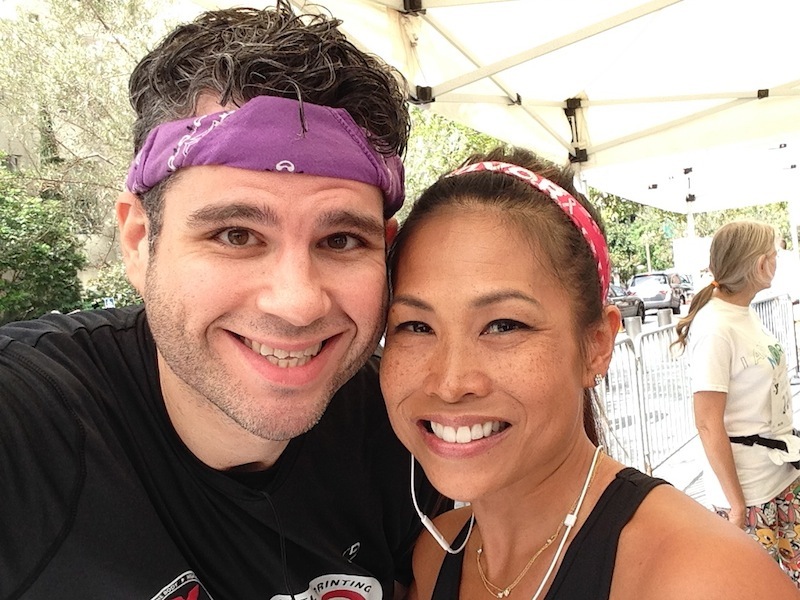 Their generosity helped make this race possible for me, and I’m extremely grateful. This entry was posted on Monday, September 22nd, 2014 at 4:05 am and is filed under Uncategorized. You can follow any responses to this entry through the RSS 2.0 feed. You can leave a response, or trackback from your own site. THANK YOU! Your generous contribution to my fundraising helped make it happen. You’re the best! I am so f’ing impressed. NICE WORK DAVID!!! Looking great. Way to go David! Hard enough to complete once. 3 times amazing! You’re a total BADASS!! Great job (x 3)! Excellent seeing you, and hanging out…. As your father, I wish I could claim some parental credit for your achievements, but I cannot, It is what you have become through your tremendous efforts. You are a continuing source of amazement and inspiration, son. Congratulations, David! Great accomplishmentS (plural)! I’m hoping I can join y’all next year! Yea, where were you, George? Missed you! Oh man, I’m sorry to hear it. That sounds terrible. I’m remaining optimistic for you as well – but I’m sure you’ll be back in the stairwell just as soon as you’re able! Fantastic job, son. Hard to believe you climbed that huge building 3 times!!! Very proud of you. Looking forward to it, Maggie!